The construction of the Leaning Tower of Pisa began in August 1173. It was interrupted several times by wars, debt and while engineers worked on solutions to correct the lean. We now know that without these interruptions that allowed the soil to compress under the tower, it would have certainly toppled over. 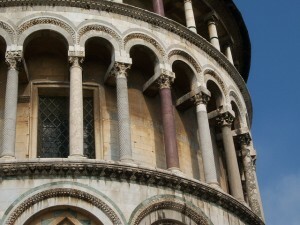 Pisa Tower was eventually completed in the mid-1300s. The Tower of Pisa is the churches belltower. The city of Pisa was at the beginning a simple but important Italian seaport. With its growth, so did its religious buildings. Its fame and power grew gradually over the years, as the people of Pisa were involved in various military conflicts and trade agreements. The Pisans attacked the city of Palermo on the island of Sicily in 1063. The attack was successful and the conquerors returned to Pisa with a great deal of treasure. To show the world just how important the city was, the people of Pisa decided to build a great cathedral complex, the Field of Miracles. The plan included a cathedral, a baptistery, a bell tower (the Tower of Pisa) and a cemetery. The real identity of Tower of Pisa’s architects is a mystery. The most accredited architects of this first phase of work are Bonanno Pisano and Gherardo din Gherardo. The second phase of construction started in 1275, and the work is attributed to Giovani di Simone. Tommaso Pisano (1350-1372) was the architect who finished the work. The leaning of the Tower of Pisa comes into the story in 1173, when construction began. Thanks to the soft ground, it had begun to lean by the time its builders got to the third story, in 1178. Shifting soil had destabilized the tower’s foundations. Over the next 800 years, it became clear the 55-metre tower wasn’t just learning but was actually falling at a rate of one to two millimeters per year. 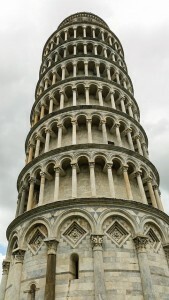 Today, the Leaning Tower of Pisa is more than five meters off perpendicular. Its architect and engineer tried to correct this by making the remaining stories shorter on the uphill side – but to no avail. It kept leaning more and more. The lean, first noted when three of the tower’s eight stories had been built, resulted from the foundation stones being laid on soft ground consisting of clay, fine sand and shells. The next stories were built slightly taller on the short side of the tower in an attempt to compensate for the lean. However, the weight of the extra floors caused the edifice to sink further and lean more. See more Leaning Tower of Pisa facts.